My latest enterprise is to some extent a jump back in time. It does not include touch-screens, fast computers or mobile phones. So, in times of mobile technology, powerful computing and funky interfaces, why would someone buy a 700 Mhz, 512 Mb RAM, desktop (=powered from a socket on the wall and plugged to a monitor) computer? May suffice that it's only £22. This is not entirely true, it's £22 + local taxes to make up to some £27, and another £20 in a plastic case, a heat sink, a USB hub, an SD card, some cables and adaptors to get some action started... Still a new computer under £50 is not bad! In case you have not guessed it, or have not heard about it, or have not read my tweets, I just bought a Raspberry Pi. Honestly, I have no clue about what most of that means, but BluRay quality and a fast 3D core got my attention, and there lies my challenge to make something beautiful out of it. The recommended beginner Operating System is Debian (or more precisely Raspbian), and they support Python as educational programming language, and I cannot agree more the latter! I found Python easy to understand and fast to learn. But Debian... that's a different animal!!! I learned that Debian is a variation of Unix, and according to Tollef Fog Heen (quoted in the Debian Reference preface) : "Unix IS user friendly… It's just selective about who its friends are.". Will I manage to be friends with Debian? 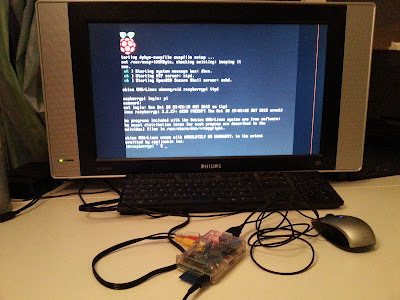 After some weeks waiting for the board to be delivered, trial-and-error, plugging the right cables in the right places, I turned my RaspberryPi on. Suddenly I found myself back in the 80's, in front of a black screen scrolling text faster than I could read it, informing of all the background operations happening before I could start interacting with the machine. Then... the cursor staring at me, expecting an input. What's next? Well, it all starts somewhere, so here I am starting my steep learning curve of Unix, making sense of a small computer and hoping to pull out some interesting project, and deciding to go back to my old blog, dust off the spiderwebs and reporting any small progress I make in my Old School shell command line, my Python programming and a new form of computing.